his blood, may share with her the glory of thine eternal kingdom; through the same thy Son Jesus Christ our Lord, who liveth and reigneth with thee, in the unity of the Holy Spirit, one God, now and for ever. O God, who have taken to yourself the blessed Virgin Mary, mother of your incarnate Son: Grant that we, who have been redeemed by his blood, may share with her the glory of your eternal kingdom; through your Son Jesus Christ our Lord, who lives and reigns with you, in the unity of the Holy Spirit, one God, now and for ever. The honor paid to Mary, the virgin mother of Jesus Christ our Lord and God, goes back to the earliest days of the Church. Indeed, it goes back further, for even before the birth of her Son, Mary prophesied, "From this time forth, all generations shall call me blessed." 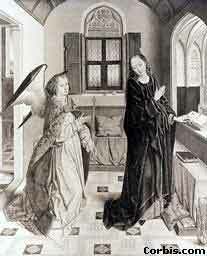 The New Testament records several incidents from the life of the Virgin: her betrothal to Joseph, the Annunciation by the angel Gabriel that she was to bear the Messiah, her Visitation to Elizabeth the mother of John the Baptist, the Nativity of our Lord, the visits of the shepherds and the magi, the Presentation of the infant Jesus in the Temple at the age of forty days, the flight into Egypt, the Passover visit to the Temple when Jesus was twelve, [Matthew 1:16,18-25; 2; Luke 1:26-56; 2]; the wedding at Cana in Galilee and the performance of her Son's first miracle at her intercession [John 2:1-11], the occasions when observers said, "How can this man be special? We know his family!" [Matthew 13:54-56 = Mark 6:1-3 = Luke 4:22; also John 6:42], an occasion when she came with others to see him while he was preaching [Matthew 12:46-50 = Mark 3:31-35 = Luke 8:19-21], her presence at the foot of the Cross, where Jesus commends her to the care of the Beloved Disciple [John 19:25-27], and her presence with the apostles in the upper room after the Ascension, waiting for the promised Spirit [Acts 1:14]. She is thus seen to be present at most of the chief events of her Son's life. Besides Jesus himself, only two humans are mentioned by name in the Creeds. One is Pontius Pilate, Roman procurator of Judea from 26 to 36 AD. That Jesus was crucified by order of Pontius Pilate pins down the date of his death within a few years, and certifies that we are not talking, like the worshippers of Tammuz or Adonis, about a personification or symbol of the annual death and resurrection of the crops. His death is an event in history, something that really happened. The other name is that of Mary. 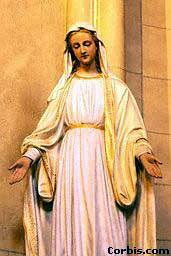 The Creeds say that Christ was "born of the virgin Mary." That is to say, they assert on the one hand that he was truly and fully human, born of a woman and not descended from the skies like an angel. On the other hand, by telling us that his mother was a virgin they exclude the theory that he was simply an ordinary man who was so virtuous that he eventually, at his baptism, became filled with the Spirit of God. His virgin birth attests to the fact that he was always more than merely human, always one whose presence among us was in itself a miracle, from the first moment of his earthly existence. In Mary, Virgin and Mother, God gives us a sign that Jesus is both truly God and truly Man. It sometimes happens that someone will report an appearance of the Virgin Mary, bearing a message, usually encouraging faithfulness in prayer. A reader has asked, "How far back do such reports go?" 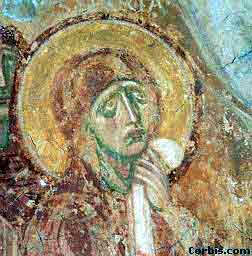 According to Donald Attwater (Penguin Dictionary of Saints), Gregory of Nyssa (335-395) says that the earliest known report of a supernatural appearance of the Blessed Virgin to anyone was of one to Gregory Thaumaturgos (213-270). At the request of a Roman Catholic listmember, I point out that the genuineness of these appearances is not official Roman Catholic doctrine. It is perfectly possible to reject all such appearances as delusions, and still be a Roman Catholic in good standing. This we may take to be the summation of her message to the world. If we listen to her, she will tell us, "Listen to Him. Listen to my Son. Do what He tells you." When we see her, we see her pointing to her Son. If our regard for the Blessed Virgin does not have the immediate effect of turning our attention from her to the One whom she carried in her womb for nine months and suckled at her breast, to the Incarnate God, the Word made flesh, then we may be sure that it is not the kind of regard that she seeks. A right regard for her will always direct us to Him Who found in her His first earthly dwelling-place.